My family comes from a long line of vegetable gardeners. I can still remember when my great grandmother had her vegetable garden, I used to wander through it when I was about 6. My grandfather on my mother’s side also had a huge veggie garden. (we used to snitch peas from it, hoping we would not get caught!) Each year I think about her with nostalgia when I plant seeds from her heirloom beans. 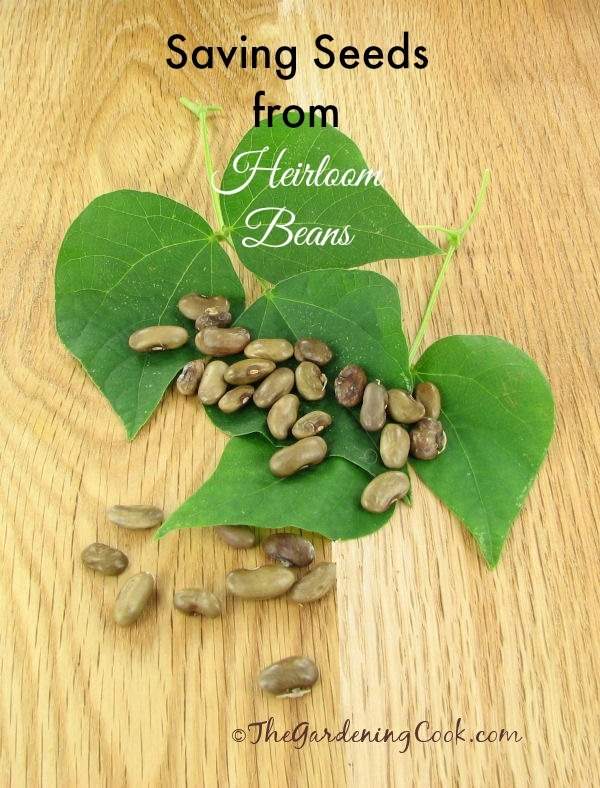 From One Generation to the Next with Seeds Saved from Heirloom Beans. Heirloom seeds are often steeped in family history. 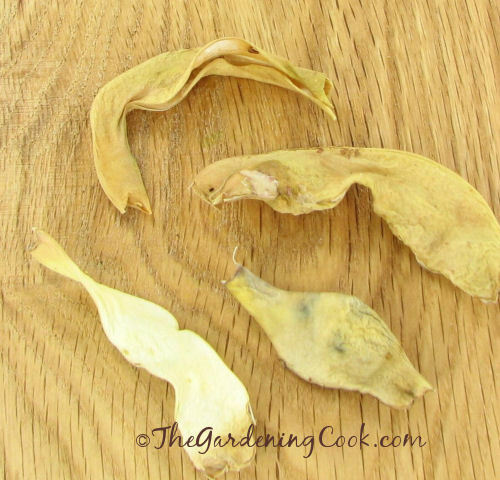 Many generations will save seeds to pass on to budding gardeners. Luckily, the bean seeds have been saved from generation to generation. They ended up in my grandmother’s, mother’s and finally brother in law’s garden. I asked him for some of the saved seeds and started growing them a few years ago. I’m saving the seeds from them now. They always grow true to the parent plant, which is the wonderful thing about heirloom seeds. Here they are growing in my garden this year under my DIY bean Teepee..
1. The beams grow flat but if you leave them long enough on the vines, the seeds inside will enlarge and make the pod very mis-shapen. 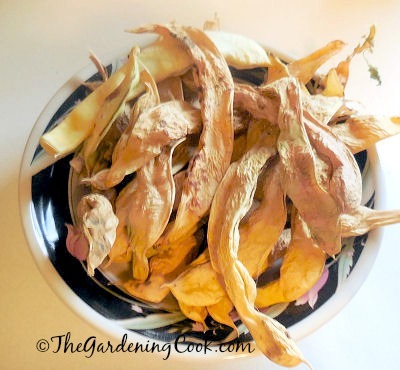 You can either just keep them growing on the vine (they will dry out themselves) or bring them indoors to dry out. These are still ripe but you can see the enlarged seeds. They will start to shrivel soon. 3. Here is a bowl of them that have dried out. 4. 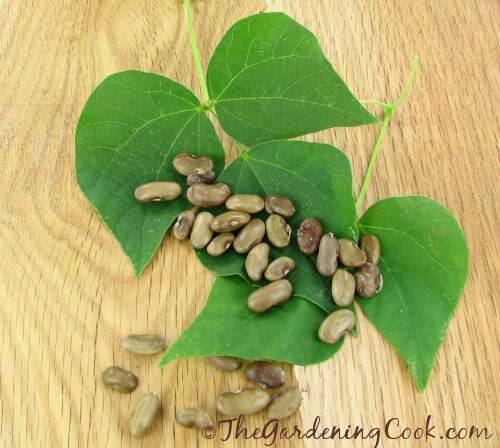 When the beans are very dry, just open the pods and remove the seeds. I just place them on paper towels at this stage and let the seeds keep drying. 5. 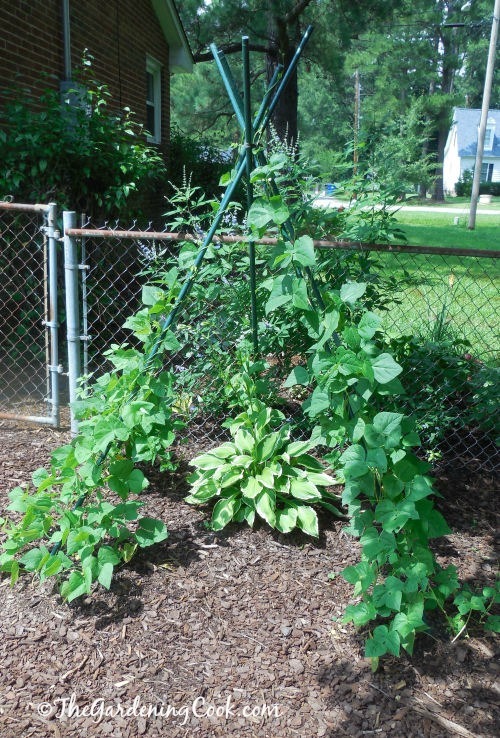 Oddly enough, the pods are light and the beans are dark, whereas the green beans are dark pods with light beans! 6. 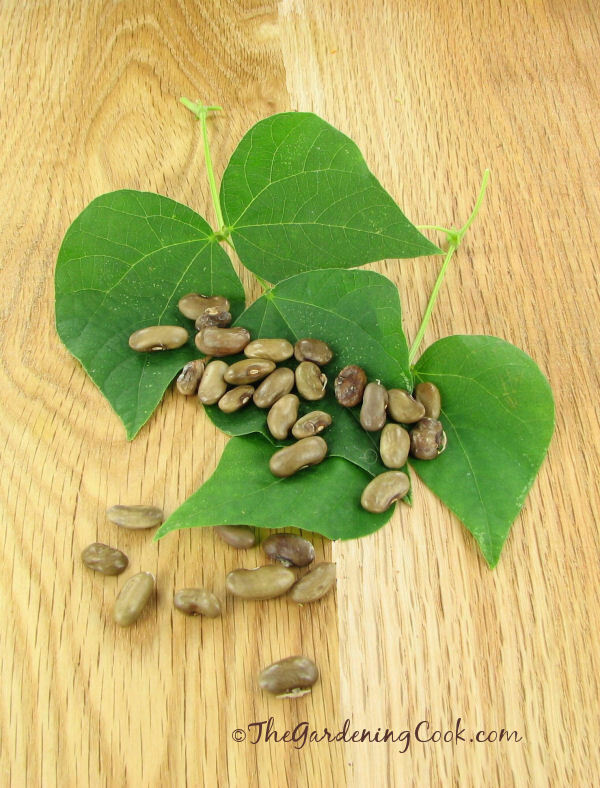 These are seeds from beans that I grew last year. 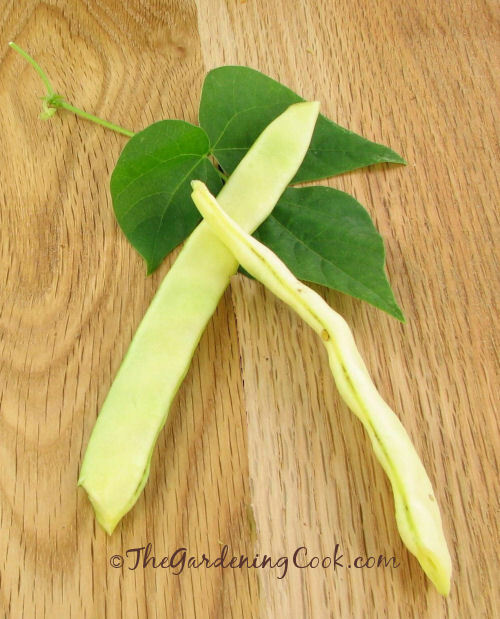 One large pod will give you about 8 or 9 seeds, so you don’t need to save many pods to get a supply for each succeeding year. 7. After the seeds have completely dried, just place them in a bag and keep them cold. I store mine in the refrigerator. They will keep fresh this way for many years. That is all there is to it. 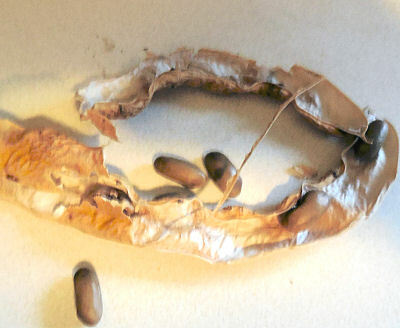 This procedure works with genuine heirloom beans seeds. Most hybrid seeds will grow plants that could grow again from saved seeds, but the new plant may not resemble the parent one. Only Heirloom plants will do this. 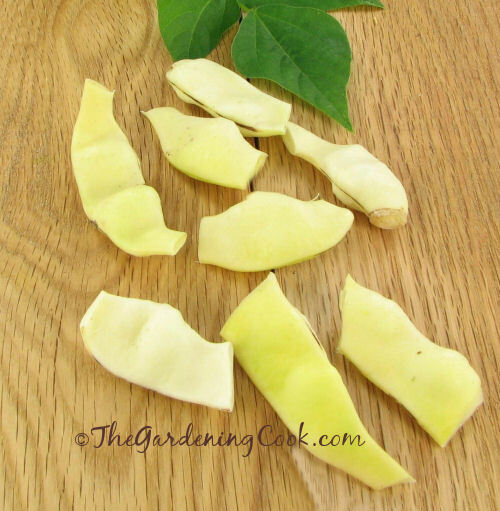 Have you saved seeds from heirloom plants? What was your experience? Please leave your comments below.